While attempting to put on a good face for her first London Season, Lady Arabella Pierrepont goes home each night to endure the raucous attention of her father's gaming partners. One evening, when Baron Pierrepont reaches a new low, offering his daughter's virginity to the next winner, Gabriel, Viscount Ashford, helps her escape. He takes her to the Aphrodite Academy, where she is given three choices: the respectable but dull life of a companion, a marriage well below her station in life, or training to become one of London's finest courtesans. Since she has taken men in dislike and would like nothing better than to drain their purses dry, she chooses the scandalous life. 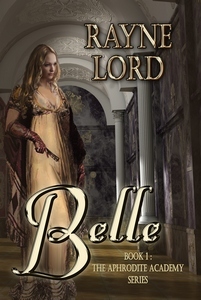 But none of the armor she has thrown up can protect her when the highest bidder for her services is Lord Ashford, the one man considers a hero. Both must grown wiser and listen to their hearts before Belle can put the abuse she suffered behind her and Gabriel can shed the casual sexual practices of the so-called Regency gentleman.